Schlurp. Schluuuuurp. Schleck, schleck. Schlick, giggle, schluuurp. They’ll make out anywhere, these horned up monkeys! Waiting for the bus, on the bus, on a bench, in a store, in front of my apartment door, in parks. Oh my god, in parks. Last Sunday, in Parque Lezama, I thought I was in the middle of a kissing competition. I felt like I should go around to each couple sprawled out on a blanket, and award them points for style and presentation. This might be a phenomenon all over Latin America, but Buenos Aires is the first place I’ve ever encountered such outrageous amounts of PDA. Sure, there’s something sweet about it, but I don’t know. A quick peck on the lips is about as far as I’m willing to go in public. But I’m from the States; we’re prudish that way. I’m sorry, I’m one of them.. I just love to make out everywhere with my bf! I think a kiss is such a good way to let him know how much I love him that I can wait (and I don’t want to) to get to my or his house to do it..
Just let me tell you, just to make you feel more horror, it’s not just a street thing. I mean, when I’m home, I make out with all the tongue story in front of my family without any shame! I’ll miss your BA blog..
Maite, you are the best. You just made our day! We will miss BA!!! 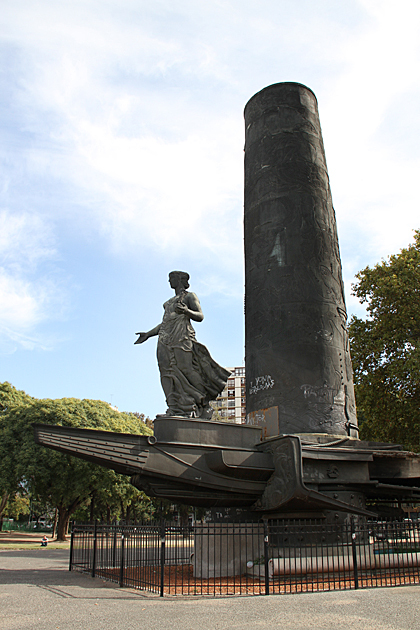 I loved watching the kiss sessions at about three places in BA, Parque Rivadavia, Parque Lezama and Plaza San Martin. I noticed that the couples would be as outrageous as they could be–while still keeping their clothes on. Sometimes a couple would sit close to me–just a single guy with a backpack (Mochilla)–and use their tongues like two people playing with swords while they kissed. Both people knew that I was watching them, and sometimes I would move closer just to see better. And they fully let me do this. It is pretty nice, and too bad I live again in the USA where people are frightened about showing affection.